With the engine switched off, the transmission is no longer lubricated. It is preferable to tow this type of vehicle on a trailer or tow it with the front wheels off the ground. Under exceptional circumstances, you may tow the vehicle with all four wheels on the ground, only going forward, with the gear lever in the neutral N position, and for a distance not exceeding 30 miles (50 km). 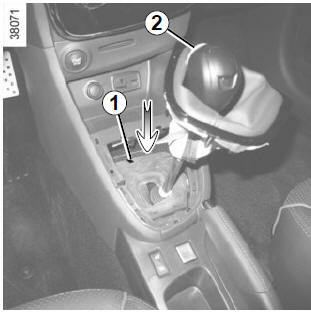 If the lever is stuck in P, even though you are depressing the brake pedal, the lever can be released manually. To do this, release the base of the lever, then use a tool (rigid rod) in the slot 1 and simultaneously press button 2 to unlock the lever. 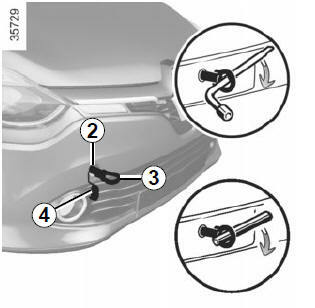 Only use the front 2 and rear 5 towing points (never use the drive shafts or any other part of the vehicle). These towing points may only be used for towing: never use them for lifting the vehicle directly or indirectly. When the engine is stopped, steering and braking assistance are not operational.